Eligibility Criteria: Bachelor’s Degree, with first Class having not less than 60% aggregate marks/CGPA of 6.5 on 10 point scale for Open/OBC candidates and aggregate marks not less than 55%/ 6.0 CGPA on 10 point scale for SC/ST candidates, in any branch of Engineering/Technology with a valid CAT/MAT score. Selection will be based on Group Discussion and Interview. 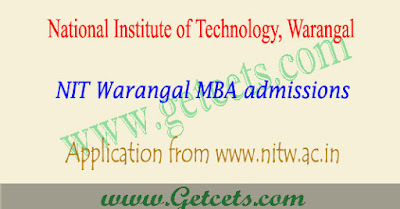 Eligibility criteria for MBA programmes can be checked by downloading the NIT Warangal MBA admission notification 2018 from the official site. The registration fee Rs.1000/- for UR/OBC and Rs. 500/- for SC/ST. 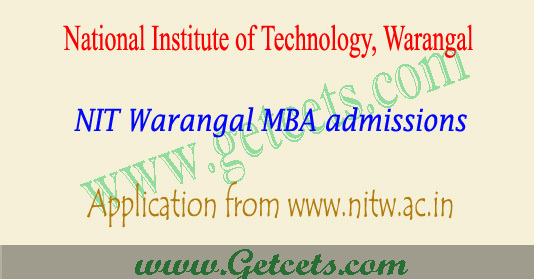 Click on the active application form pdf link given below to fill the NIT Warangal MBA Application 2018 Form and submit it on or before 19th Feb 2018. Candidates are required to download the application form available at www.nitw.ac.in. Filled in application form with all the necessary documents including the registration fee receipt to be send to the “Chairman (Admissions), NIT Warangal, Warangal – 506 004, Telangana State” super scribing the envelope with “Application for Admission into M.B.A – 2018” The proof of payment of registration fee (Rs.1000/- for UR/OBC and Rs. 500/- for SC/ST candidates) must accompany the application form. The link to pay registration fee through SBI i-collect is www.onlinesbi.com/sbicollect/collecthome.htm. Other payments like mobile payments (IMPS), NEFT, RTGS and Direct Transfer will not be accepted. If paid by any chance, it will not be refunded. Copy of the CAT/MAT Rank Card with valid score or admit card of CAT/MAT Exam (In such a case, the candidate must produce the CAT/MAT score card during the Group Discussion and Personal Interview process, if short listed). Applications without these documents shall be deemed to be incomplete and shall be rejected. Selected candidates are required to report physically for taking admission during 10th or 11th April, 2018 along with all the original certificates and proof of payment of tuition fee.